A good cookbook is a treasure chest. You can have it for years, returning to it again and again for the same few favorite recipes, and then one day you open it to a different page and find an unsuspected gem. I’ve just lucked in that way with Diana Kennedy’s 45-year-old classic The Cuisines of Mexico. 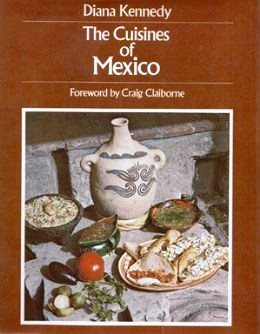 This was my very first Mexican cookbook, and many of its recipes intimidated me quite a bit, back then. Ingredients were strange and not easy to find. Cooking procedures were unfamiliar too. My first attempt was Kennedy’s guacamole, which we adored at first bite. 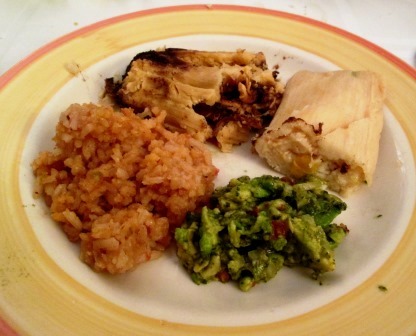 Little by little, I tried other dishes, eventually working up to her magnificent 4½-page chiles rellenos recipe. As my confidence grew – and Latin-American ingredients became more accessible here – I acquired other Mexican cookbooks, newer ones that caught my interest and largely displaced Kennedy from my repertoire. Except for her guacamole, which is still the only one I ever make. Now in late summer, when my greenmarket’s bountiful fresh corn keeps calling out to me, I recalled that Kennedy has recipes for corn soups (one of which I’d blogged about several years ago). Why not try another one? So I did, and it was an idea as brilliant as the recipe. It’s called simply sopa de elote – corn soup, and there’s very little but corn in it. The next instruction seemed very odd: first, put the corn and half a cup of water into a blender and process to a smooth puree; then put that puree through a food mill. Seemed like suspenders and a belt! But OK, I did it. It made a surprising difference. As you see above, what the blending produced seemed to be smooth, but the food mill extracted a lot of chaff from the kernels, leaving a slightly thick corn liquid. In a saucepan I melted 2 tablespoons of butter and cooked the corn liquid in it for 5 minutes, stirring continuously. Then I stirred in 1¾ cups of milk and a little salt, brought it to a boil, and simmered it for 15 minutes, stirring occasionally. 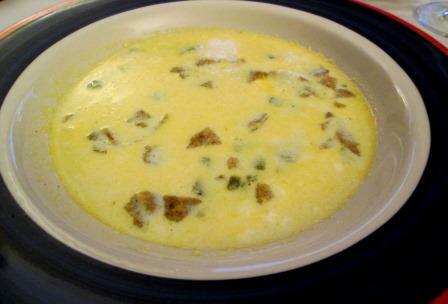 The butter kept trying to rise and separate out as the soup cooked, but it didn’t seem to be a problem. It calls for a dice of fresh chile poblano – or canned green chilies if necessary. It’s now easy to get fresh poblanos, but I had one, roasted, peeled and seeded, remaining in the freezer from last fall’s crop, so I used that. It calls for crumbled cream cheese or Boursault. I was sure those were substitutes for a Mexican cheese that wasn’t widely available in the US in the 70s. Now we can easily get authentic queso fresco, which crumbles nicely. I used that. It calls for small squares of tortilla that I’d have had to fry to crispness. Out of pure laziness, I just broke up some packaged corn tortilla chips. To finish the dish I put some chile and cheese in the bottom of each bowl, poured on the hot soup, and strewed the tortilla chips over it. It was lovely. The soup base was the pure soul of exquisitely sweet corn. This is being a good year for corn here, so the soup just sang of green fields and summer. Each garnish provided its own flavor and texture contrast: the poblano a hot chile zing, the cheese a faintly sour soft curd, and the chips a lightly spicy crunch. I’m sure I’m going to make this soup again before corn season is over. Incidentally, the corn soup was the centerpiece of a pleasant, down-home Mexican dinner. Before it we had Kennedy’s guacamole with tortilla chips and salsa, and after it we shared two large (purchased) tamales, one of cheese and one of chicken mole, along with which I served red Mexican rice and more of the guacamole. Left to myself, I’d cook chicken at least once a week, I’m so fond of it. My companion across the daily dinner table, however, doesn’t even remotely share that enthusiasm. He indulges me often enough, but I don’t push it too far. So when, recently, he was going to be away from home for several days, my poultry passion flared up and I began looking at chicken recipes. For some years I’d had an item in my big recipe binder called Peruvian Roasted Chicken, which I’d never tried. I can’t remember where it came from, but its technique and spicing are very different from anything I’ve done with a chicken before. This was clearly its moment. 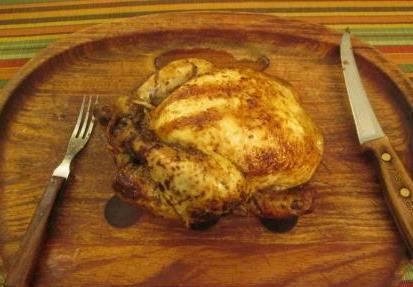 No problem about cooking a whole bird for one person: I can happily eat chicken for several days in a row. I had to make a few adjustments there. I won’t keep garlic powder in the house, so I pressed three cloves of fresh garlic. I had only whole cumin seeds, so I crushed some in a mortar. The only paprika I had on hand was Spanish smoked pimentón, so I used that. And the oil I used was olive. All that made quite a heady brew. Next I was supposed to pull all loose fat off the chicken and wash it in a quart of cold water mixed with the juice of a lemon. That seemed unnecessarily fussy for my fresh, clean chicken. I rinsed it in plain water and rubbed a cut lemon over it. Then, with a sharp-tined fork, I had to stab deep holes all over the bird, “including under wings” (why so specific there? I don’t know), and rub the marinade into it, inside and outside. The bird and all its marinade was to be sealed in a plastic bag and put in the refrigerator for at least 2 hours, preferably 24. 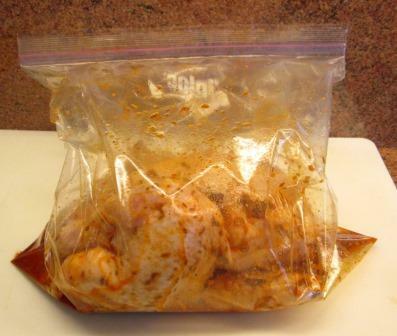 Since I wanted to eat chicken that evening, I left the bag on the kitchen counter for 4 hours, figuring that would equal at least twice the effective time under refrigeration. When the bird emerged from its bag I had to truss it for the rotisserie. That was a slippery and messy procedure, at the end of which my hands felt well marinated too. But onto the spit it eventually went. According to the recipe, the spit-roasting should take 45 to 55 minutes. I know that, on my rotisserie, chickens take quite a bit longer than that, and indeed this one did: about an hour and a half, being basted every 15 minutes with the reserved marinade. 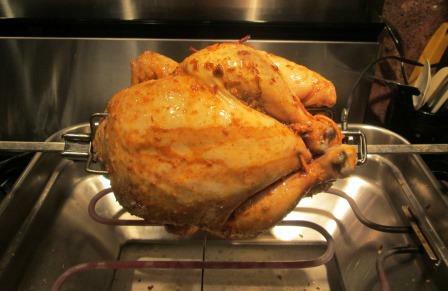 Expecting a powerful punch from the seasonings, I was surprised by how mild the roasted bird turned out to be. The skin was fairly spicy, but the flesh – though moist, tender, and tasty – was only lightly aromatic, mostly from the cumin. Afterward, I checked a few other Peruvian chicken recipes on the web and, while there’s a lot of variation on the marinade ingredients, all the descriptions suggested that “peruvification” yields a bird with a strong, distinctive flavor profile. Not mine. Be that as it may, I enjoyed my chicken thoroughly (for two dinners and two lunches). But I fear it’s not a dish that would make a convert of Beloved Spouse. Local corn is finally in at my Greenmarket! Corn season started late this year, and then there were flood washouts from heavy rain in parts of New Jersey that grow the best corn. It’s still not exactly abundant, but I’m doing my best to make up for lost time – as is, I hope, the corn. After my first joyous indulgences in plain, sweet corn on the cob, I was ready to think about corn recipes. I remembered one I hadn’t gotten around to last year: a salad of roasted fingerling potatoes and corn, dressed with a lively set of flavorings, in Richard Sandoval’s New Latin Flavors. I’ve written here about several of that book’s recipes, and while some came out very well, I’ve learned to approach them with caution. There’s some bad copyediting: For instance, an item on an ingredient list may never show up in the instructions; and quantities given for various ingredients seem disproportionate both to each other and to the stated number of servings. This potato and corn salad was a case in point. For two of us, I was making half of a recipe said to serve six (I expected some leftovers). 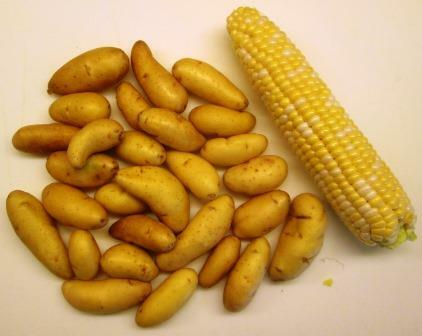 It would have wanted a whole pound of fingerling potatoes to a single ear of corn. I bought the pound of potatoes, but when I set them out next to the corn, they looked like far too many. I made an executive decision to use just half a pound. That was partly based on my sense of proportion and partly out of awareness of our age-diminished capacities (sigh). 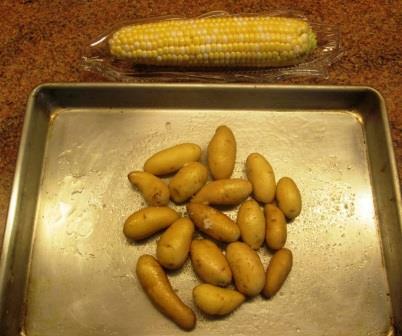 My unpeeled potatoes and the whole cob of corn were to be “tossed” on a rimmed baking sheet with 1½ teaspoons of olive oil – quite a stingy amount, even for my fewer potatoes. Interpreting the tossing metaphorically, I rolled the vegetables around in the oil. 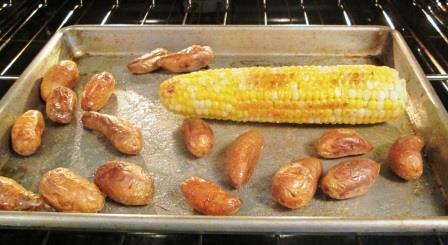 Then the corn was to come out, the potatoes to be salted, and the pan to go in a 425° oven. After 20 minutes of roasting the potatoes and turning them occasionally, I added the ear of corn to the pan, and kept roasting and turning everything until the vegetables were tender, about 20 minutes more. 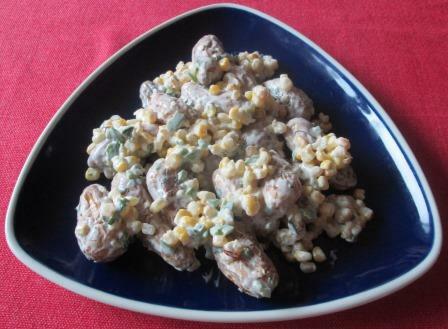 When everything had cooled, I cut the kernels off the corncob, put them in a bowl along with the still-unpeeled potatoes, and dressed them with a tablespoon each of lime juice, minced jalapeño pepper, and chopped parsley, plus about 2½ tablespoons of mayonnaise. When first tasted for salt and pepper, the mixture was entirely dominated by the jalapeño. However, after the bowl sat in the refrigerator for a couple of hours, the seasonings had blended very well, the jalapeno retreating to a pervasive, genial warmth. In the evening I took the salad out, transferred it to a serving plate, and let it stand at room temperature for half an hour, before serving it alongside grilled sirloin burgers, lettuce, tomatoes, and red onion – classic summer casual dining. It was pleasant enough. The flavors were good, though the lime juice was indiscernible. The jalapeño gave the dish a light spicy lift. We would have preferred olive oil instead of mayonnaise, which in this case became slightly gummy, and we would have liked twice as much corn as there was. The potatoes hadn’t taken up many of the seasonings, and their skins were a little tough and not pleasing. (I can’t blame the recipe for that: These were a supermarket’s commercial fingerlings, not local or freshly dug ones, because my Greenmarket didn’t have any this week.) I was very glad I’d cut the potato quantity as I did – it made the right amount for two. Bottom line: Some time later in the summer I might try adapting the concept of this recipe for a cold dish in a picnic-style meal, but it’s not likely to become a regular in my repertoire. Just adding roasted corn to a basic potato salad sounds attractive, and I’ve noticed in recent years that in France and Italy, where eating corn on the cob is all but unknown, corn kernels have been turning up in all sorts of dishes, so there’s a lot to explore. I always thought of shrimp sandwiches as using cold, mayonnaise-based shrimp salad. 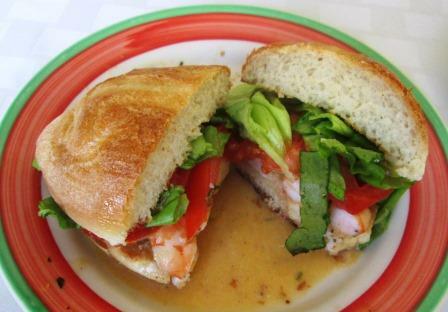 Now I’ve discovered a different kind of shrimp sandwich – warm, spicy, saucy, and good! The recipe, from Richard Sandoval’s New Latin Flavors, is called Tortas con Camarones al Ajillo, or Garlic Shrimp Tortas. One further reason I liked it was that most of the ingredients are things I keep in the kitchen or can get easily, so no special shopping was required. I did change a few things when I made the recipe. 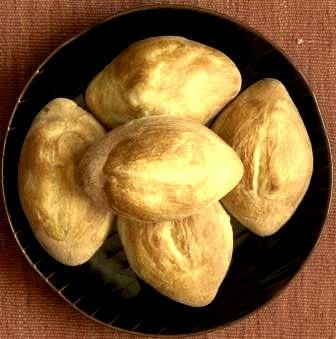 First, it calls for just “crusty rolls,” which could be anything: French, kaiser, ciabatta, etc. I wanted to have true Mexican torta rolls. Online research told me there are two varieties, called telera and bolillo, which seem to be identical except for the way the tops are slashed. I found a nice recipe for them on the King Arthur Flour website and baked a small batch, using the easier bolillo slash. I persuaded Beloved Spouse to stem, seed, and cut up two small dried de árbol chiles, a variety I like very much, while I sliced two cloves of garlic very thin. 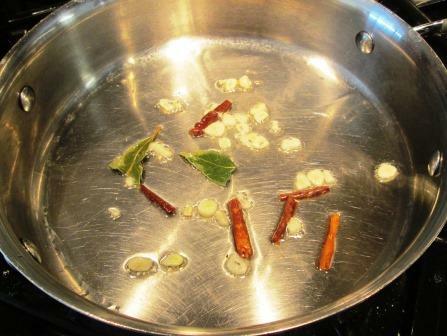 These went into a large pan along with olive oil and a bay leaf, and sauteed until the garlic began to brown. 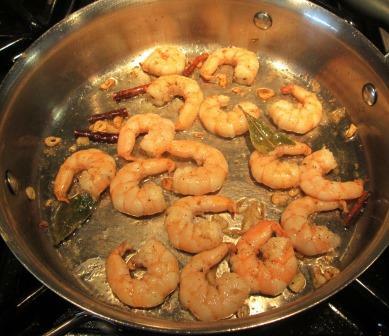 I added the shrimp and cooked very briefly, until they just turned opaque . . .
. . . and removed them from the pan. Into it I poured in ¾ cup of white wine and 1½ tablespoons of lemon juice and cooked until the liquid had reduced by half. Off heat, I put the shrimp back in and left them there to soak up flavors while I prepared the rest of the ingredients. The tortas were to receive a garnish of tomato slices and a heap of baby arugula. For several days previously I’d had some halfway-flavorful Mexican tomatoes – winter’s best option – and a big plastic box of wild arugula, both of which I’d been using. Alas, when I reopened the box this time, the arugula had gone slimy. I had to substitute shredded Boston lettuce – a much milder green. While two split bolillos were toasting lightly, I reheated the shrimp, taking out the pieces of chile and the bay leaf, stirring in a teaspoon of chopped parsley and the grated zest of half a lemon, and dissolving two tablespoons of thinly sliced butter into the sauce for a final enrichment. At last I could put together the tortas. The bottom half of a roll on a plate; the shrimp heaped on, the sauce poured over, plus tomato slices, lettuce, and the top half of the roll. Though a little messy to eat, the tortas were scrumptious. There was an almost symphonic interplay of flavors and textures – nutty sweetness of shrimp, subtle scent of garlic, spicy heat of chiles, bright acidity of wine and lemon, richness of butter, softness of tomato, and crispness of lettuce, all contained by a very tasty roll. I only regret having lost the arugula – it would have made another tangy element. Next time, for sure! No, not tennis. Last week I was in Trinidad on a birding trip, enjoying warm weather, lush tropical scenery, over 170 species of gorgeous birds . 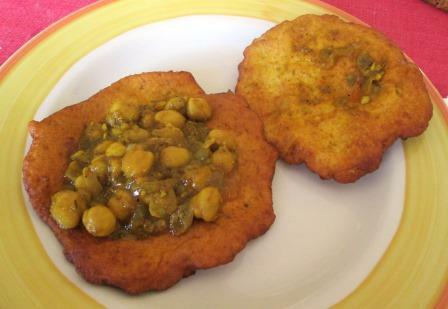 . . and one terrific culinary specialty: Doubles. 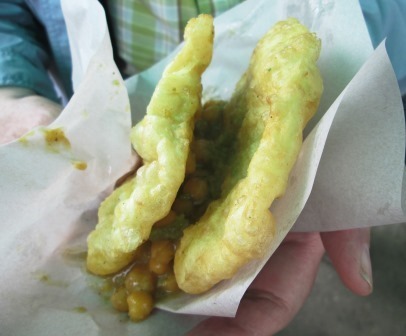 Trinidad’s favorite street food, doubles are gloriously sloppy “sandwiches” made with bara, a kind of fried bread, and channa, curried chickpeas. 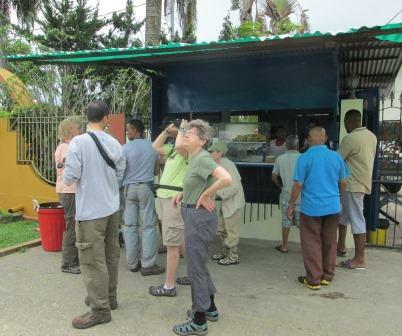 Roadside stands serve doubles on a sheet of greaseproof paper, to be eaten in the hand, standing up. Here’s part of our group waiting to be served (but also keeping an eye out for any passing birds). The choices on offer were mild, medium, or hot. I had the medium, and Beloved Spouse of course had the hot. Each doubles (singular and plural both end in “s”) cost $4 Trinidadian, which is about 65ȼ US. They were amazingly good! The light, puffy bread, the tender, succulent chickpeas, the savory curry spicing, and the fiery hot sauce – together all just sang and danced on the palate. I immediately knew I’d have to try making doubles for myself. Trinidad-style curry powder, which has no hot chiles, is milder than its counterparts in other geographic regions but very aromatic from ginger, nutmeg, cinnamon, cardamom, and allspice, in addition to the usual turmeric, coriander, and cumin. The region’s hot sauce is a real killer, made with the devastatingly hot Scotch bonnet peppers, plus vinegar, mustard, and papayas. 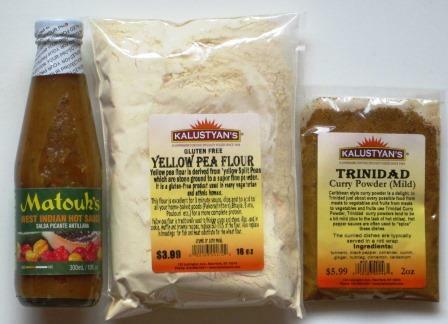 The yellow pea flour is not in any of the doubles recipes I found online, but a cookbook I’d looked at in Trinidad and a few people I’d talked to there had told me it’s important for doubles. So Saturday morning I started making the bara for a lunch of doubles. 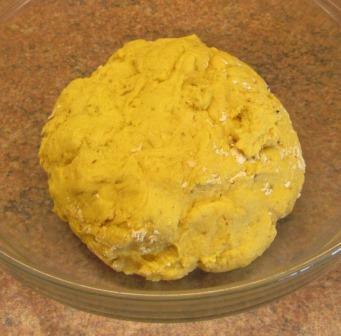 Not knowing if the pea flour would need different treatment, I cautiously used it only half and half with all-purpose flour. 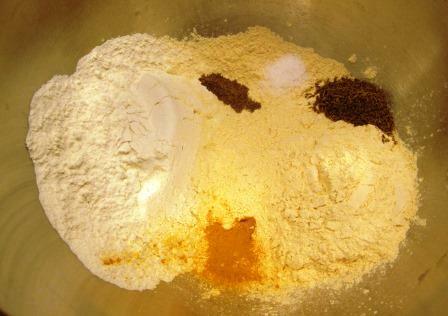 Additional dry seasonings were turmeric, cumin, salt, and black pepper. When those were thoroughly mixed together, I stirred in yeast, warm water, and a little sugar to make a fairly soft dough, kneaded it, and set it aside to rise. While the dough was rising I prepared the channa. 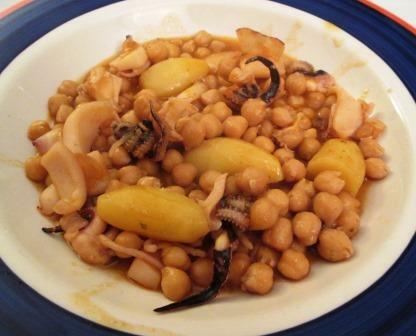 That involved softening sliced onions and minced garlic in oil; adding the curry powder, water, chickpeas (canned and rinsed), cumin, salt, and black pepper; and simmering until the chickpeas were tender, which took about half an hour. Finally came the tricky part: shaping and frying the bara. Here I’m afraid I didn’t do too well. 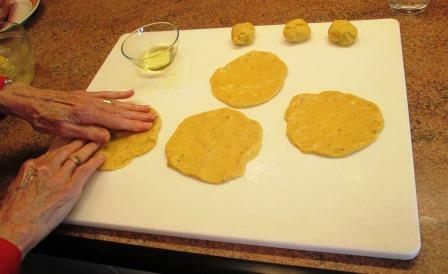 The instruction was to take walnut-sized lumps of dough and flatten them out to four- or five-inch rounds. Stretching them as thin as I could without their ripping apart, I still needed twice as much dough to achieve that size. One internet recipe warned that if the rounds weren’t excruciatingly thin, flat, and oily, they wouldn’t come out with the right texture. And, alas, mine didn’t. I might have had the oil too hot, too, because though fried for only eight seconds on a side, they darkened in a way that the ones in Trinidad never did; and to the extent they puffed at all, it was in the middle, not around the sides. The good news is that, while my doubles looked nothing like the ones at that roadside stand, they tasted quite good anyway. The bara were darker, denser, and heavier, perhaps from the pea flour. 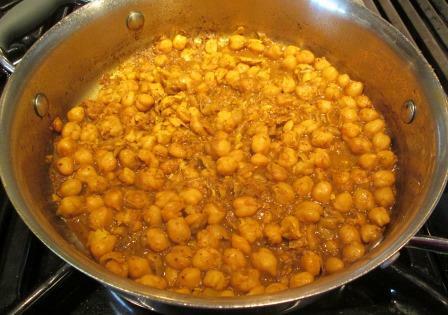 And too much of the channa’s liquid had cooked off. 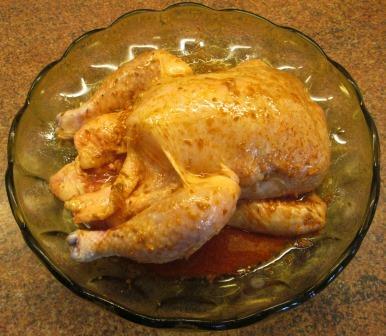 But a few dashes of the hot sauce added the needed moisture and completed a very lively overall flavor profile. 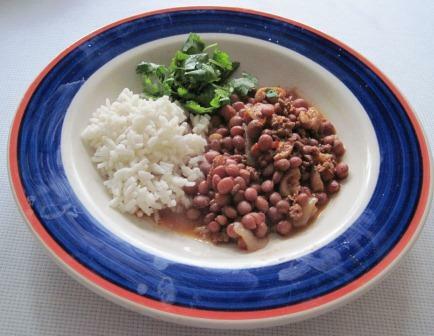 That’s nowhere near the true Trini dish, I fear (especially since it’s on a plate, not a piece of paper), but it was an interesting culinary experiment for me. I may well do it again, trying a few changes to achieve lighter, puffier bara. 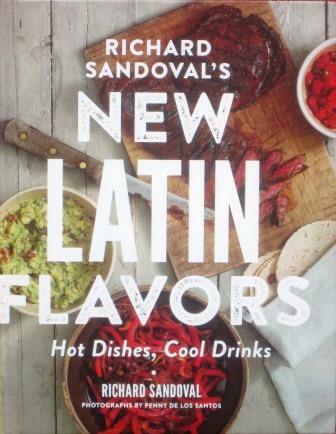 The new recipe I made this week is for a lively, versatile condiment from Richard Sandoval’s book New Latin Flavors. Though it’s called an aioli, there’s no garlic in it, so it’s really a flavored mayonnaise. But flavored with chipotle in adobo, it’s a very interesting thing. I first had it at a dinner at Sandoval’s New York restaurant, Pampano, last fall; subsequently saw the recipe in his book and meant to try it, but never did. Then this week I discovered a forgotten few remnants of canned chipotles in adobo among the many jars and bottles that live on the door shelves of my refrigerator. I thought I’d have to discard it, but I tell you, chipotles in adobo may hold the secret of eternal life. That stuff goes on forever! You don’t use very much of it in any one recipe, and the supply that I bought has been in and out of my freezer several times for longer than I care to admit to. It never seems to deteriorate. 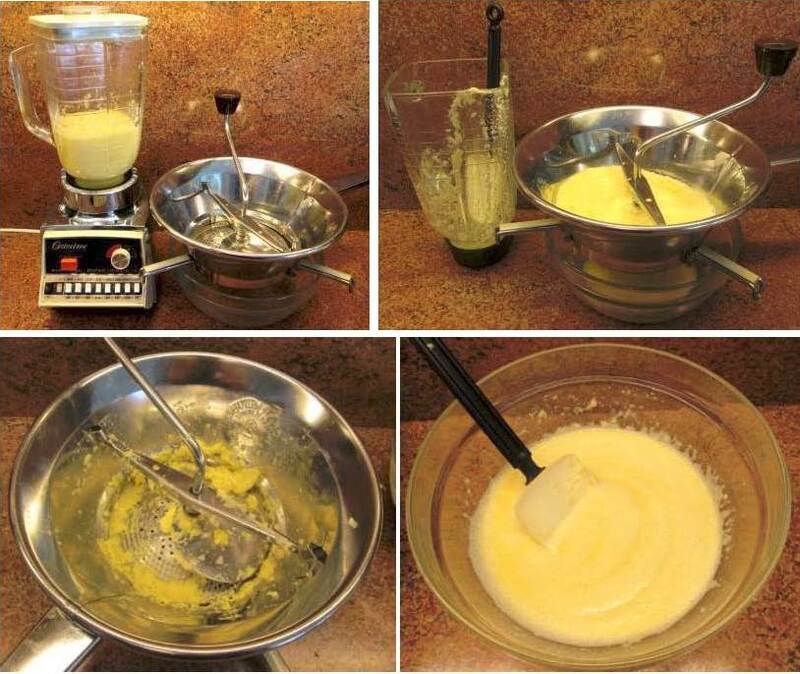 So I took the deathless substance out and made a small batch of the book’s aioli. Very complex preparation: One chipotle, chopped and blended with half a cup of mayonnaise until smooth. I didn’t even use homemade mayonnaise – just good old Hellman’s. 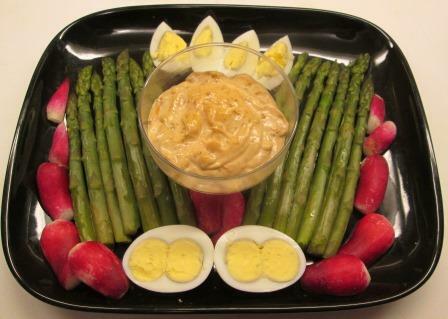 Beloved Spouse and I had it as the condiment on a cold vegetable first course, and its smoky tang gave a very nice lift to boiled asparagus, raw radishes (first of the season, at last! ), and hard-boiled eggs. We didn’t finish all of it that evening, so I’ve been dabbing it on other foods in subsequent days. Assuming that you like the flavor of chipotles to begin with, this aioli’s zing goes well with many things. We’ve used it on hot vegetables and cold roast beef, in salad dressing, and as a sandwich spread. I’m really pleased with it. Next I’m thinking about a potato or macaroni salad made with it, since the season for those salads is just around the corner. Guess I’m going to have to buy a new can of chipotles in adobo so I can make this “aioli” any time I like. Santa Maria pinquitos are my all-time favorite bean for chili. I’ve written enthusiastically about them before, here and here. They’re small but they can hold their own among any strong or spicy flavors. 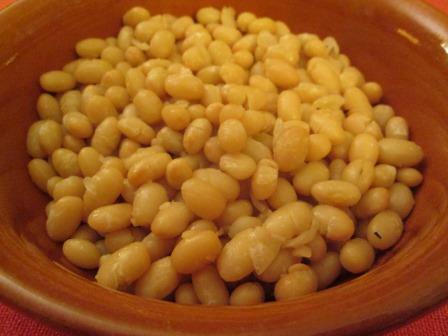 I love the flavor of chickpeas, and I use them in many guises, some of which I’ve written about here and here. These are an artisanal variety from Umbria. 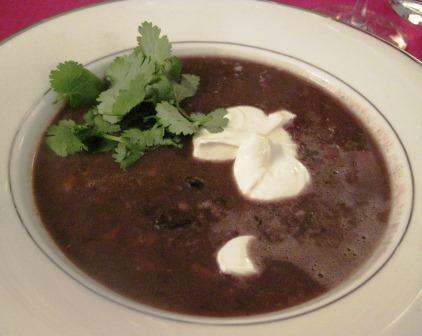 Midnight is a robust black turtle bean, which I usually use in Mexican dishes, such as here and here. They make especially good soups. Castelluccio lentils are the best lentils I’ve ever tasted. 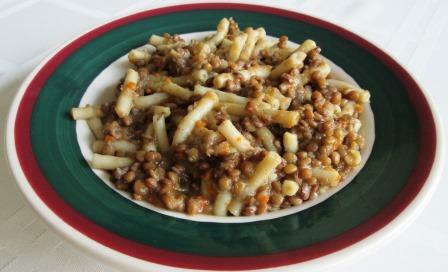 A favorite way to serve them is in my own pasta with lentils recipe, and I’ve also written about them here and here. Yellow Indian lentils are actually skinned and split mung beans. I keep them for making moong dal, a mild, pleasant side dish in Indian meals. Domingo rojo is a dark red bean that I bought last fall from Rancho Gordo. It’s supposed to be especially good for red beans and rice. I’ll be trying it one day soon. Normally I also have white beans in the pantry: Great northerns or marrows, for cassoulets and plain American baked beans, but I’ve already used up this winter’s supply of those. 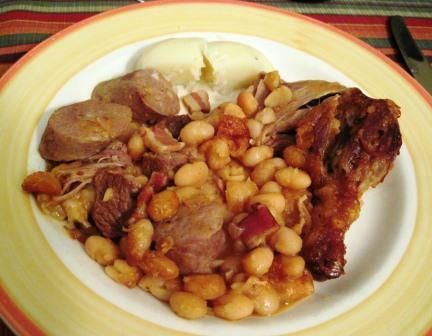 And once I brought back from France some Coco de Paimpol, which is probably the world’s best cassoulet bean. 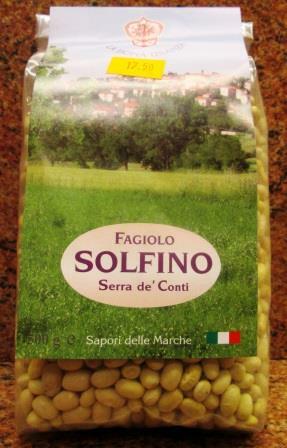 And now I have a new treasure to add to my collection: Solfino beans, an ancient variety from Italy’s Marches region. These are a very rare, pale yellow heirloom bean. I’d tasted them years ago when they were briefly being grown in Tuscany under the name Zolfino, but apparently they didn’t do well there and almost went extinct. There’s now one artisanal grower of them in the Marches, back where they originated, and when I found some in a local specialty shop, I snatched up a bag. The back label gives a whole history of the variety: fragile, difficult to grow, picky about soil and water, low-yielding, requiring mostly hand tending. All that makes them ghastly expensive (I paid $17.95 for 500 grams), but they are extraordinarily good. 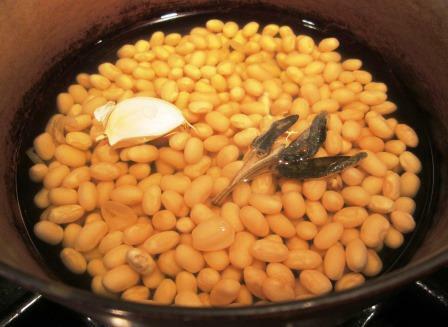 I prepared my precious Solfinos very simply, in order to really taste the bean itself: gently boiled with just a little garlic, fresh sage, and olive oil. I served them dressed with nothing but extra-virgin olive oil and salt. That was all they needed to bring out their subtle, rich, warm, and yet delicate flavor – hard to describe but heavenly to taste.